Swap a sleeping bag for a voucher! 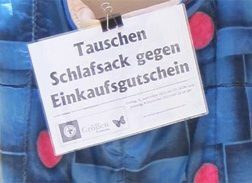 … and our campaign continues: “Swap a sleeping bag for a voucher” As in recent years, you can bring us your no longer needed but fully functional sleeping bag and get a shopping voucher for 10 €. We donate the sleeping bags to the homeless!